We have been hinting at a new controller based on the TB6600 stepper driver chips over the past few months. We now have a fully functional prototype. Check out the blog post that gives you a sneak peek at it. At last! GRBL + 4 drivers + >2.5Amps. Is this the first GRBL controller made with >2.5A drivers or am I mistaken? Out of curiosity, is this an Arduino + shield combo or a single board that hosts both GRBL and drivers? The controller is designed into the main board. We don't know of any "turn key" grbl solutions with this much power. 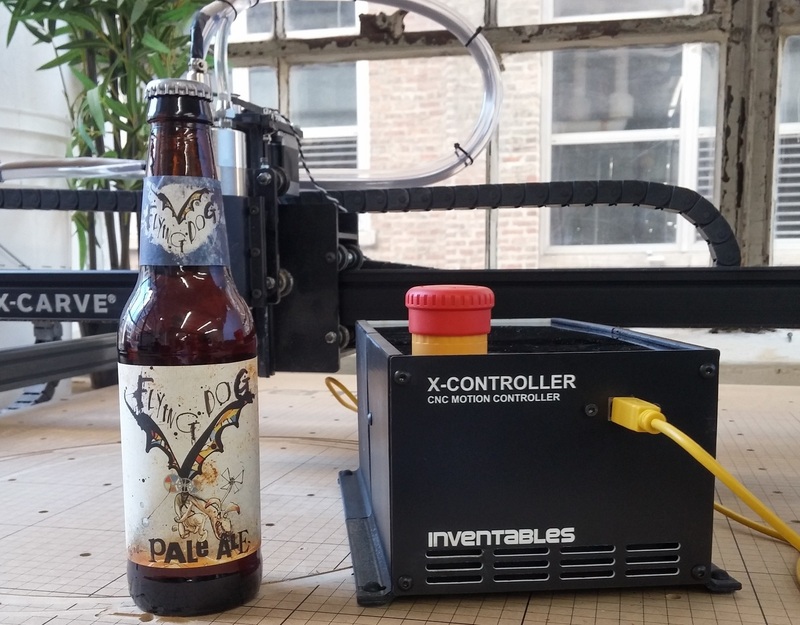 I approve of both the controller and the photographer's choice of beer. If it's not too pricy (errr...the controller, not the beer) then you can count me in as picking one up very soon after they go on sale. I have a set of 270 oz-in steppers from an incomplete DIY machine build that would go nicely with one of those and the X-Carve. Maybe for the less in-the-know of us, could you indicate to us what this means in regard to the X-Carve? @TimKettering This is designed for 3 axis machines like the X-Carve. Once we are ready to sell it, we will add an option for it in the X-Carve product configurator. It will also be available as a stand alone product. Just higher current than what we have now? Higher current capability for more powerful stepper motors, integrated emergency stop, easily accessible breakouts with nice connectors for motors and accessories...it's a really nice all-in-one package that makes hooking things up and controlling them a breeze. It wouldn't be a necessary purchase for someone with a functional machine, but for someone like me who already has some upgrades in mind like bigger motors, it's a great package that solves a lot of fiddly connection problems. There was a lot of geek-speek in that blog but I think I got a gist of what it will do. If it is indeed a plug-n-play setup with all the electronics/software except the motors - and in a nice neat enclosure to boot - I'd be interested. But not until I had an idea of what the cost would be. I know you can't be specific now, but surely you can tell us if it will be closer to $1.50 or $1500. There was something in the blog about double-motors on one axis. That's nice, but I'd like to see a package for a lathe, where that option wouldn't be needed - just a Z, X, and tail-stock turret. On the AC accessory, will there be a version for those of us in the 240vac world? @sketch42 What is the standard outlet the 240VAC world would use? Looks pretty great, might be my first upgrade to my X-Carve after I hopefully re-coop some costs! Any plans for a z-touch probe terminal? @Rusty There was an oops in my artwork for the rear panel and the word "Probe" got left off. It was supposed to be here. It is supported with its own terminals. This is really cool. 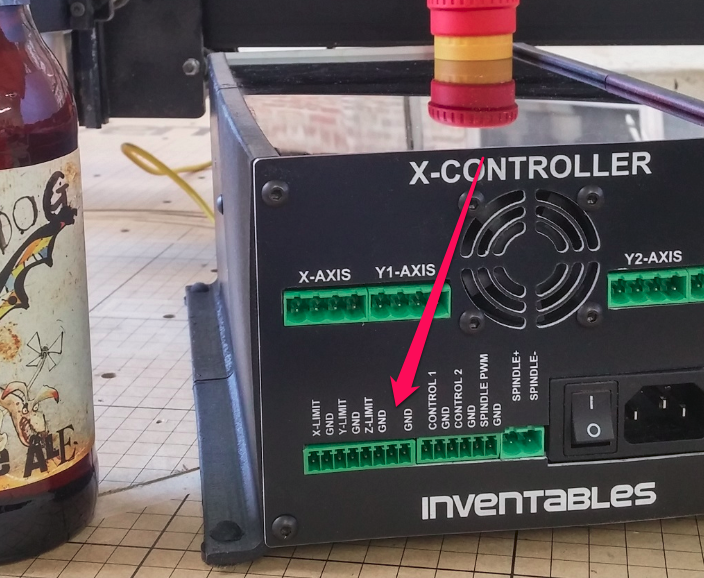 How about something like XLR connectors for the steppers and limit switches instead of the green terminal blocks? I suppose I could create a cable with XLR on one end and that molex style connector on the other. Also it would be cool if you ran a DB25 connector to the back, so you had an option of using the USB/GRBL control, or disabling the GRBL part, and using Mach3/Parallel port control with the same controller. @Rusty You can always mount the controller upside down. International AC Voltages. To all interested, please reply with the connector type you require. If it turns out we only need a few types, we might consider them. Here is a good reference for connectors. This is true, but than all the nice screen printing will be upside down!